Kathryn was born and raised in St. John’s. She joined the Pearlgate coaching staff in 2017 as co-coach for the jumps program. After several years as a competitive gymnast, Kathryn started training track and field at Pearlgate Track and Field Club in 2008 with coach Becky Sjare. As a Pearlgate athlete, she has competed locally, within the Atlantic provinces, and nationally in the 100m, long and triple jump, and 4x100m relay. She competed for Memorial University at the Atlantic University Sport (AUS) Championships, and at the Canada Summer Games in 2009 and 2013. She has also trained at the Harlow Athletics Club and with the University of Toronto Track Club. 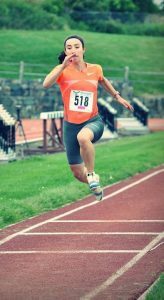 Using her experiences training with other track clubs, as well as her professional knowledge as a physiotherapist, she uses an evidence-informed and innovative approach to coaching.